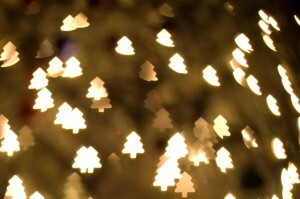 Bokeh, in photography, is the blurry or out of focus parts, or rather the aesthetic quality of the blur, in your shot. There are ways to create these effects digitally with Photoshop or even an App for iPhone. But if you have a DSLR, you can use this tutorial by Chris Perez (Source: http://www.apartmenttherapy.com/make-your-own-bokeh-effects-filter-for-your-dslr-168271) to create a cheaper, homemade filter, which he works best with a 50mm lens with a low f-stop. You will be creating two pieces for this type of filter so that you can have interchangeable filter shapes. First step is to create the section that goes over the lens. Now you can cover your camera lens with the makeshift lens cap and add different filter shapes to the front for different effects. There you have it! Your own little experimental fun with bokeh!